This sauce works well as a dipping sauce, tossed with your favorite protein to coat, and is an essential ingredient in the Hot, Sweet, and Sour Seitan Ribs with Lemongrass Bones. 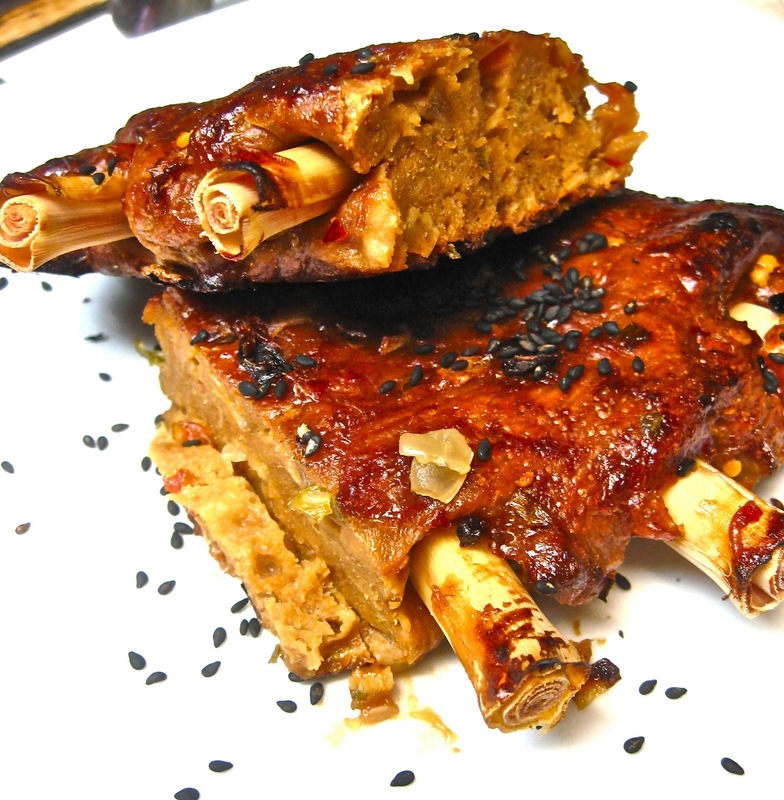 The lemongrass used for the “bones” in these ribs gives a nice citrusy aroma to the seitan, besides looking eerily like the real thing. I know this looks like a long list of ingredients, but it comes together pretty easily, with lots of downtime. 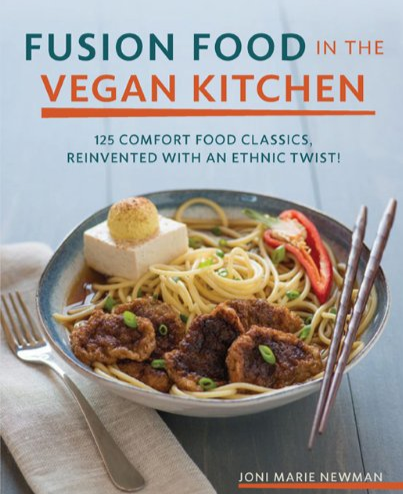 In a large mixing bowl, mix together the vital wheat gluten flour, whole wheat pastry flour, nutritional yeast, red pepper flakes, salt, yellow onion, scallion, and garlic. In a separate bowl whisk together 1 cup (235 ml) of the Hot, Sweet, and Sour Sauce, water, soy sauce, olive oil, ketchup, sesame oil, hot mustard, Sriracha, and liquid smoke. Add the wet mixture to the dry and mix until combined. Knead in the bowl until a very elastic dough is formed. Some of the onions will fall out. That’s okay. Let the dough rest for 20 minutes. Divide the dough into 4 equal pieces. Try to flatten the pieces of dough into a rectangular shape and place on the baking sheet. The dough is still very elastic, making this step fairly difficult, and that is normal. Allow to rest for an additional 20 minutes. While the dough is resting, remove any dirty outer layers from the lemongrass and cut each stalk into 4 equal pieces (20 pieces total). Once again, attempt to form the dough into rectangles. It should be a little easier this time, as the gluten should have relaxed a little by this point. 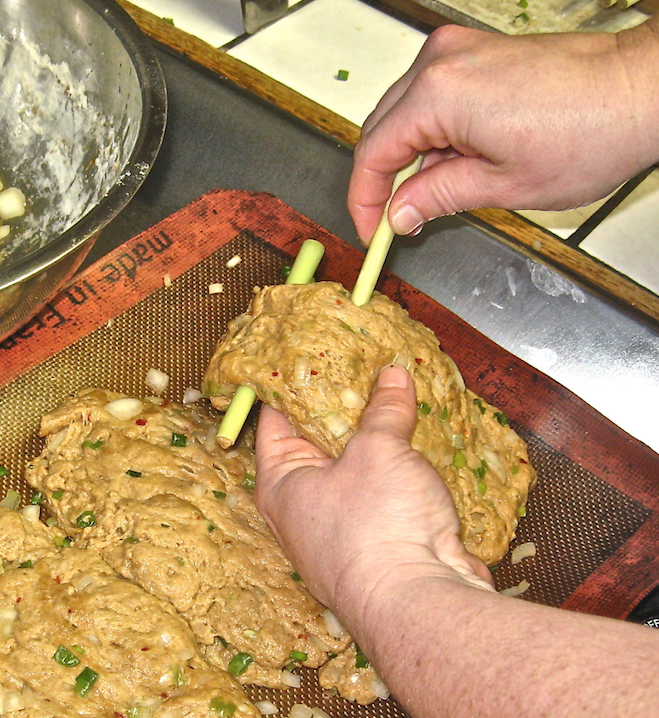 Push 5 stalks of the lemongrass through each piece of dough, about 1 inch (2.5 cm) apart. Repeat until all 4 pieces each have 5 bones. Brush each “rack” of ribs with a generous layer of the remaining 1 cup (235 ml) Hot, Sweet, and Sour Sauce on both sides. Gather up all of the onions that have fallen out of the dough and sprinkle them on top of the ribs (they will stick to the sauce). Cover the entire pan loosely with foil, to create a steam tent. Bake for 1 hour. After 1 hour, remove from the oven, remove the foil, flip, brush on another thick layer of sauce, and return to the oven for 30 more minutes, uncovered. The outside crust should be tough and caramelized from the sugars in the sauce, giving the ribs a nice meaty bite, but the insides will be soft, tender, and chewy. Remove from the oven and brush on a final layer of sauce before serving. Do not eat the lemongrass bones. Nice recipe , really liked them a lot , thanks for a helpful post . So good that it could even fool an omnivore! Wow, I've never seen a recipe like this - it looks brilliant! Don't need to be fooled but have made the regular bb ones and my family loves them and wants more like it, so planning to make this. I have powdered lemon grass how much to use? Well, the lemongrass is used as the "bones" so I don't think powdered will work. You can use chopsticks as bones, or leave them out all together. Maybe add just a small pinch of the powder for flavor.